Curvature file for New York State as shown in Google Earth. For an overview of how Curvature can fit into your trip planning, see How to Use. This page will detail the mechanics of viewing the files. The Curvature program generates map files that can be viewed in Google Earth. These map files are generated for all regions of the world and are refreshed every two weeks to take into account updates to the underlying data sourced from the Open Street Map. To view Curvature files, you will first need to install Google Earth on your computer. Google Earth is a free program available for both desktop computers as well as mobile devices. Head to http://kml.roadcurvature.com/ to download a compressed KML file for your region. Most people will want to download the “c_1000” version of the files as these highlight only the most twisty roads — those with approximately 1km or more of curves. The KML files are ordered by continent, country, and state/province. Click on the “c_1000” link to download the file to your computer, usually it will end up in a “Downloads” folder on your computer. 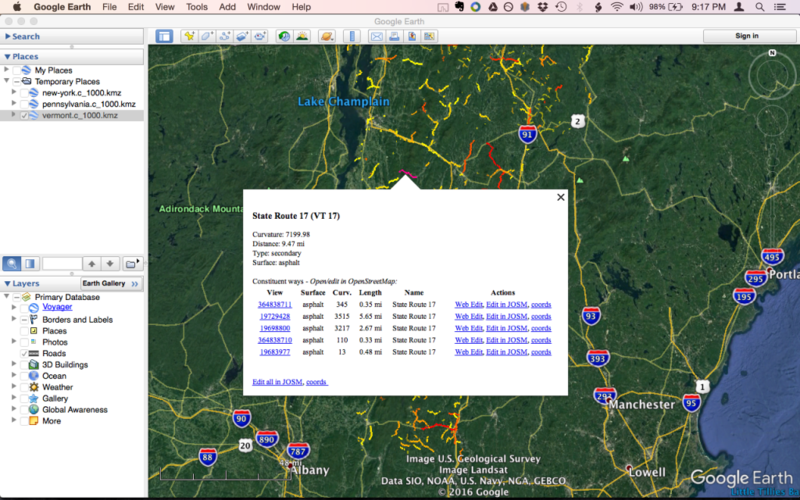 Find the KML file in your downloads folder, it will be named something like “vermont.c_1000.kmz”. Double-click on it to open it in Google Earth. 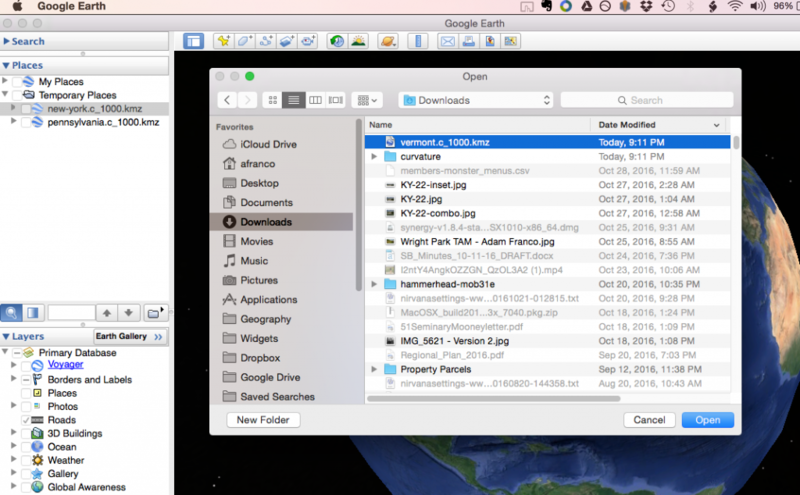 If for some reason it doesn’t open, first open Google Earth and choose “File » Open…” and select the file. 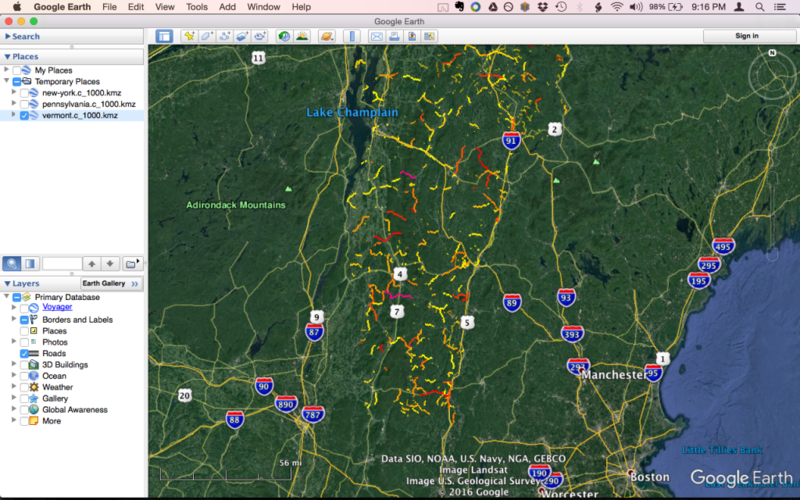 The “vermont.c_1000.kmz” file loaded in Google Earth. Clicking on a highlighted road will pull up details. Based on my experience looking at the data and riding the roads, I’ve found that the the curvature values regularly correlate to how much fun I have riding the road — assuming a good road-surface, low traffic and not too many stop-signs. Google Earth doesn’t have great built-in route-planning tools, so it is usually easiest to simply identify the curvy roads via the Curvature files in Google Earth, then plan your route using other route-planning software such as Garmin Base Camp, Google Maps, or similar.